WHEN Huang Bing graduated from university in 2005, he promised himself he would make his first 1m yuan (about $155,000) within three years. It took him a bit longer, but no matter: if his business, a collection of online cosmetics stores, maintains its current trajectory, he will soon count his first billion. In a few years he expects annual revenues to reach 10 billion yuan. Mr Huang’s company, United Cosmetics International, is only one of thousands on Taobao Mall, a huge online shopping centre. He spotted a demand from women in China’s hinterland for branded cosmetics—and advice on how to use them. “A lot of women in rural areas don’t have access to quality products,” he explains, guiding visitors through the firm’s headquarters in the outskirts of Hangzhou, two hours’ drive south-west of Shanghai. On several floors, at desk after desk, “beauty consultants” busily type answers for customers. As goes United Cosmetics, so goes the Chinese internet. It is growing by leaps and bounds (see chart 1), as ever more people log on from phones, homes or offices, or in huge internet cafés (pictured). The China Internet Network Information Centre reckons that the online population, already the world’s biggest, has risen by 6% to 485m this year. And almost two-thirds of people are not yet online. Just as striking, as the country’s internet grows larger it also grows more distinctly Chinese. “The beauty of the internet is that it easily adapts to local conditions,” says Paul Zwillenberg of the Boston Consulting Group (BCG). The Chinese internet is the best example of the argument that, far from creating uniformity, the global network is shaped by local forces. Those forces can be divided into four: the demands of Chinese consumers; the attitudes of Chinese entrepreneurs; China’s offline economic development; and the role of the state. Start with consumers. China’s internet users are younger than the Westerners who first logged on about 20 years ago. They are hungry for entertainment and mostly poor (but fast becoming richer). Foreign internet companies have struggled to replicate their success in China (though they have done quite well as investors, a current quarrel between Alibaba Group, one of China’s internet giants, and America’s Yahoo! notwithstanding). Chinese firms, most of which began by copying Western models, prospered when they devised clever adaptations. Take Tencent, China’s second-biggest internet firm by market capitalisation. It started as a clone of ICQ, a chat service, but quickly outgrew the original by offering China’s youthful masses a cheap way to communicate and have fun. Tencent’s chat service, which boasts 674m user accounts, and most of its other offerings are free. The firm makes most of its money by selling virtual goods (a dress for an avatar, a weapon in an online game) for play money that users buy with real cash. Similarly, Taobao, which is owned by Alibaba, was launched to compete with the Chinese service of eBay, an auction site. It quickly overtook its rival by not charging transaction fees. But its main achievement has been to overcome perhaps the biggest barrier to online shopping in China: lack of trust. Alibaba’s online payment system, Alipay, the world’s largest by value of transactions, has an escrow function that withholds payment until goods have been received (most deals are still cash on delivery). Taobao today boasts 370m registered users. It accounts for three out of four online sales in China and reportedly one out of two packages posted. Vancl, a start-up that intends to go public soon, is satisfying both consumers’ desire for instant gratification and their growing brand-consciousness (or dislike of pirated goods). Its well designed but cheap clothes and shoes can only be ordered on its website. In the big coastal cities they are often delivered the same day—a service most big e-commerce sites now offer. A recent addition to this innovative group is Sina Weibo. Run by Sina, another leading internet firm, it is often billed as the “Twitter of China”, but it allows users to attach comments, pictures and even videos to their messages. 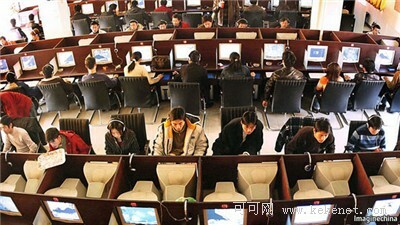 Sina has also recruited thousands of celebrities to use the service. China’s internet entrepreneurs are different, too. There are lots of part-timers. Students have taken en masse to selling on Taobao: many university dormitories double as storerooms for goods awaiting orders. Full-time entrepreneurs may have less experience than their Western counterparts, but make up for that with sheer effort. “They do not want to miss their chance to make it big—which is why they work like crazy and practically abandon life,” explains Kai-Fu Lee, who used to run Google China but now heads Innovation Works, a start-up incubator in Beijing. This drive to win explains why Chinese online entrepreneurs are often more pragmatic than Western ones and do not mind adapting something invented elsewhere, says Hans Tung of Qiming Ventures, a venture-capital firm. They tend to be less enamoured of technology. At Google in Silicon Valley, maths problems are pinned to some toilet doors, so that brains need never be idle. The headquarters in Beijing of Baidu, which has 75% of China’s search market, feels much less dominated by engineers. “We’re focusing more on products and satisfying our users’ needs,” says Robin Li, Baidu’s boss. He is making a big bet on what he calls “box computing”, which turns Baidu’s search box into a window to all kinds of applications and services. The will to win and the abundance of venture capital make China’s internet a “ferociously gladiatorial environment”, says Richard Robinson, an American who has founded several start-ups in Beijing. Rivals spring up literally overnight. There are 80 social networks, 200 online-video services and 2,000 online-coupon sites. Questionable business practices, such as kickbacks for online advertisements, add to the competitive frenzy. The founders of companies that come out ahead in this battle often prefer to enjoy their new wealth rather than become serial entrepreneurs, as successful Silicon Valley folk are wont to do. Others set out to build sprawling online empires, which is one reason why China’s biggest internet companies, more than their Western counterparts, fight each other directly and on several fronts. Alibaba, Baidu and Tencent are becoming internet conglomerates offering similar sets of services. China’s relatively underdeveloped economy also plays a role. In the West online companies often disrupted existing industries. In China they are more likely to fill a void. “The internet will be a much more robust force in China because offline businesses are much less efficient,” argues Duncan Clark of BDA, a telecoms consultancy in Beijing. Except in big cities near the coast, conventional retailing is fragmented and underdeveloped. Yet much of the country has been covered by fast internet pipes. A basic broadband connection costs less than 100 yuan a month. The result will be a “huge leapfrog effect”, says David Michael of BCG. The consulting firm recently predicted that the annual value of China’s e-commerce market would quadruple by 2015, to $305 billion. It may then be the world’s largest (see chart 2). The size of the market makes it possible to try new business models. Although Taobao and its sister site Taobao Mall, where only professional sellers are allowed, somewhat resemble eBay and Amazon, their executives have a grander ambition. They want to build an “operating system for e-commerce”, as Richard Wong, a Taobao executive, puts it. Taobao sells no goods, but supplies the services that make it easier for others to trade: payment, instant messaging and even logistics. In January Alibaba said it would invest up to 30 billion yuan in new warehouses. The media industry, with its lumbering state giants and fragmented private sector, has created another opening: for online-video sites, such as Youku. It looks (and sounds) much like YouTube, but Victor Koo, its boss, likens it to Hulu and Netflix, American sites that deliver television programmes and films over the web. Since most Chinese are just discovering digital video, says Mr Koo, users generate only about a quarter of Youku’s content. The rest is made professionally, for instance by television stations or Youku itself. Youku also illustrates the fourth feature of China’s internet: the role of the state. Until 2007 regulation was rather lax, allowing start-ups to dominate the industry, notes Bill Bishop, a longtime China-watcher. Yet as the internet’s economic and social importance has grown, so has political intervention. In June 2010 the government published a white paper outlining its regulatory plans. In May it said it had created a central agency to oversee the internet. Regulation mostly involves licensing and self-censorship. Youku needs several licences. The rules on censorship are vague, and firms err on the side of caution. “You have to know what is sensitive,” says an executive at a big internet firm. Youku has developed a sophisticated monitoring system: dozens of editors watch new material and classify it, building a video database that can be used to find good content, but also to block undesirable clips. Even though complying with such rules can be costly, hardly anyone complains, even in private. Regulation also makes life harder for would-be competitors, foreign or Chinese. “People take the government as a given,” says Mr Lee of Innovation Works. He adds that he had to think more about censorship at Google. Some big internet firms even seek the government’s input before launching a service, in effect involving it in product development. When designing Weibo, Sina apparently worked closely with regulators. The service is capable of quickly stopping certain users from logging on and blocking posts containing certain terms. When protests broke out in Inner Mongolia in May, the name of the province could no longer be searched for. At the same time the state sees benefits in microblogging and social networks. They allow citizens to vent their grievances and give prompt warning if, say, corruption in a provincial city is getting out of hand. “Beijing has a political interest in keeping China’s internet commercially healthy,” Mr Bishop wrote in his blog, DigiCha, in February. Will China’s internet continue to have distinctively Chinese characteristics? Some differences from the West’s will fade as the industry and China’s economy mature and the country’s internet population grows older and richer. Other features will probably persist, for example the dominance of three digital conglomerates, Alibaba, Baidu and Tencent. The influence of the state is likely to reinforce these “three mountains”. They are well versed in dealing with state agencies and they can spread the costs of regulation over a broad revenue base. If anything, the three will probably become even more dominant. Rather than buying promising start-ups, they tend to build their own version of a popular new service. Western firms build too, but also buy. If Chinese start-ups are likely to be crushed, finance will be hard to come by. Sina, boosted by the success of its microblogging service, is considered a test case for whether smaller firms can catch up with the big three at all. Abroad, China’s internet firms are largely untested. Tencent is the most daring: it owns a stake in Mail.Ru, a Russian portal, for instance. Baidu is planning to offer its services in a dozen other languages. “We are going to expand into many other markets,” Mr Li said recently. Expanding abroad will not be easy. Being Chinese, a cultural advantage at home, may be a disadvantage elsewhere. Still, China’s internet will have global influence. In some ways it already has. Tencent has made money from virtual goods and currencies; Silicon Valley is following. Twitter has been looking at what Sina Weibo does. Some European e-commerce sites are said to be interested in Vancl’s model. Expect more of China’s online characteristics to be adopted in the West.